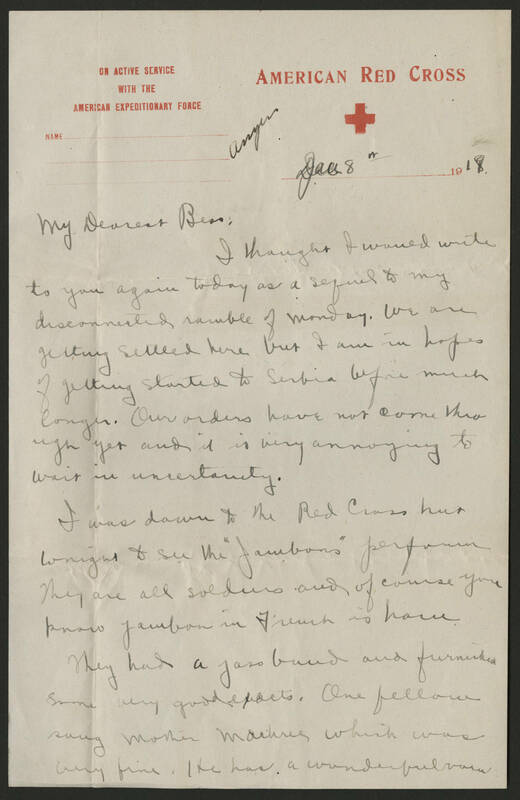 Dec 8th 1918 My Dearest Bess, I thought I would write to you again today as a sequel to my disconnected ramble of Monday. We are getting settled here but I am in hopes of getting started to Serbia before much longer. Our orders have not come thru [sign?] yet and it is very annoying to wait in uncertainty. I was down to the Red Cross hut tonight to see the "Jambons" performance. They are all soldiers and of course you know jambon in French is ham. They had a pass [board?] and furnished some very good acts. One fellow sang Mother Machree which was very fine. He has a wonderful voice.